Zazaki is a member of the North-Western Iranian sub-branch of the Indo-European language family. Also known as Kırmancki, Dımılki or Kırdki, it is native to the historical region of Dersim in Eastern Anatolia with communities in today’s cities of Western Turkey. Zazaki speakers also participated in the Turkish labour migration to Europe during the final decades of the last century. Always dominated by other languages, Zazaki has become particularly vulnerable and endangered through the enforced assimilation pressure in the diaspora. In December 2015 the conference Zazaki – yesterday, today and tomorrow was organized by the Zazaki Language Academy of Vienna under the patronage of UNESCO-Austria with funding from WienKultur, the cultural department of the City of Vienna. Among others, the papers pointed to the ongoing limitation of Zazaki use to symbolic functions and thus demonstrated the urgent need to revitalize the language in everyday life. Furthermore, the conference offered a platform to present, discuss and evaluate the various initiatives as well as problems in the standardization of the language. 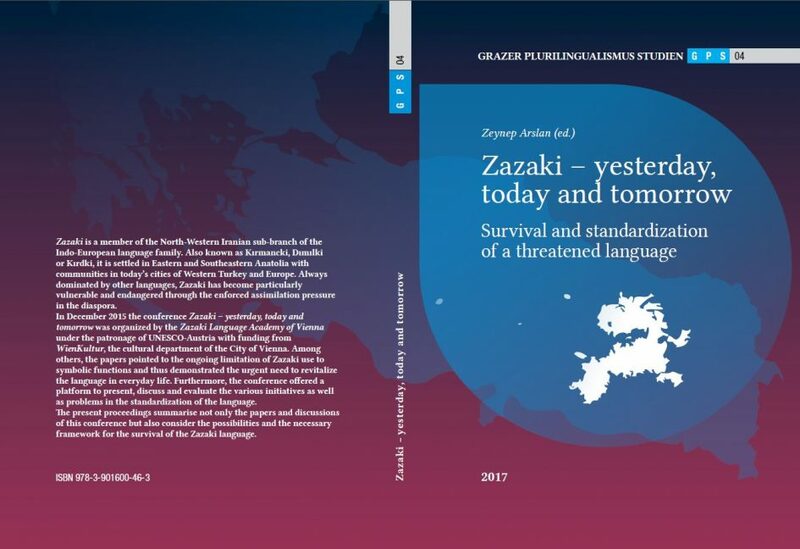 The present proceedings summarise not only the papers and discussions of this conference but also consider the possibilities and the necessary framework for the survival of the Zazaki language.